New in this release (version 65 of Ensembl) is the ability to save your selected tracks as a configuration. You can load in a set of tracks you chose with a simple click of the ‘Load configuration’ button. A simple example follows. From the Region in detail view, click on Configure this page. 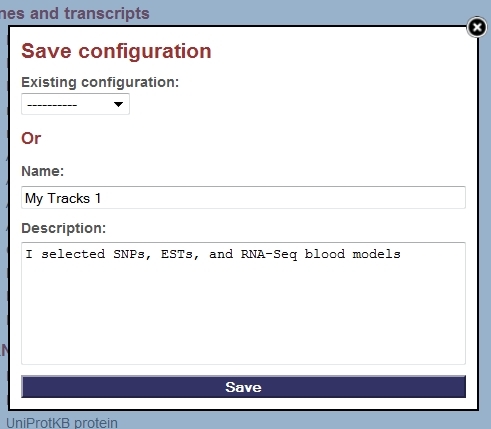 Choose some tracks, for example, in the dbSNP menu: ‘Sequence variants (dbSNP and all other sources)’, in the EST alignments menu: ‘Human EST’, and in the RNA-Seq models menu: ‘blood intron’ and ‘blood’. Now click the Save as button at the bottom left of the menu. Name the configuration as My Tracks 1. You can add a description as well, for example I selected SNPs, ESTs, and RNA-Seq blood models. Click Save. Now you have a configuration named My Tracks 1! Even if you deselect the tracks and turn other data on, you can always go back to this selection by clicking on Configure this page and then Load configuration. Try it on other views like Gene summary! Clicking on Configure this page allows acess to the Manage configurations tab. Here, you can make a configuration set. A configuration set allows tracks across many different Ensembl views to be switched on all at once. We hope you find this useful! Keep your eyes out for future sharing of configuration, making it easy to send ‘your Ensembl view’ to a lab mate or colleague.